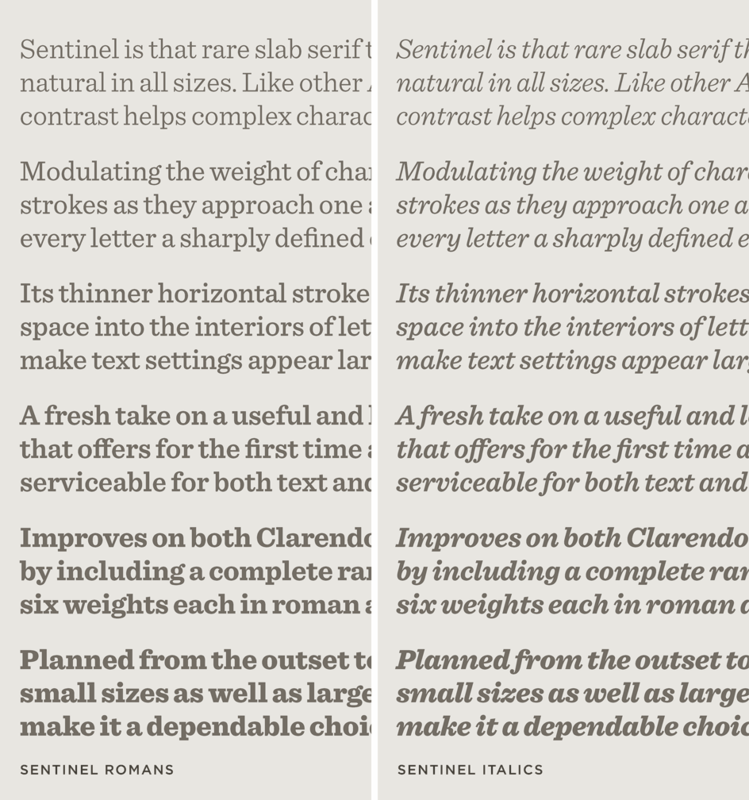 Sentinel Font Features: Range | Hoefler & Co. Throughout its full range of weights, Sentinel’s design employs strategies that help it flourish in sizes both large and small. Slab serifs often have a specific size at which they look their best. Typefaces that shine in display sizes can look awkward when set smaller, if their designs are too rigidly geometric, or their spacing too doctrinaire. Yet typefaces designed for text often look peculiar when enlarged, once they begin to reveal the accommodations needed to help them work at small sizes. Sentinel is that rare slab serif that feels natural in both sizes. Like other Antiques, its moderate contrast helps complex characters adapt to a broad range of weights, and allows letters like a and g to maintain their traditional forms. Modulating the weight of strokes as they approach one another helps give every letter a sharply defined edge, making characters crisp at large sizes and clear at small ones. And Sentinel’s thinner horizontal strokes allow more space into the interiors of letters, helping make text settings appear larger than they actually are. Range. Throughout its full range of weights, Sentinel’s design employs strategies that help it flourish in sizes both large and small. Short-Ranging Figures. Numbers of an uncommon construction, included as alternates to the familiar “lining figures,” help give Sentinel its warmth and steadiness. Language Support. Sentinel features our Latin-X™ character set, covering more than 140 languages throughout the world — including all of Central Europe.